Check Out The Pond Tour Photo Link on the Photo Gallery page. 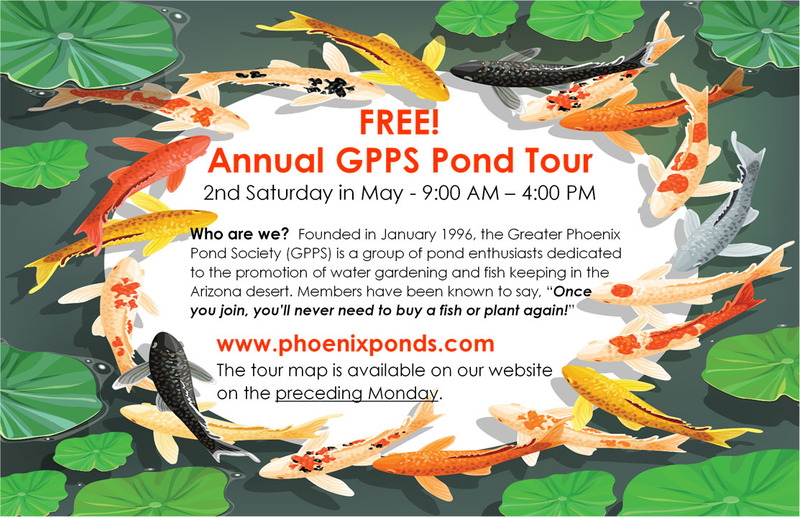 Once a year, the Greater Phoenix Pond Society organizes a tour of members' ponds. From among all the members who volunteer to open their yards to the public each year, a group is selected according to location, in an effort to create a circuit of ponds close enough to one another that they could all be visited within a few hours. Pond owners typically answer questions, give advice, offer shade and refreshments, and oftentimes put up displays detailing the pond's construction and inhabitants, seasonal photos of their project, and educational information for distribution. Ponds on the tour can range in size from approximately a few hundred gallons up to 11,000 gallons! All of this comes together to produce an educational and social experience that touches hundreds of people. The 2001 Tour was at the Boyce Thompson Arboretum. We hope to see you visiting or hosting a pond on our next tour!